The amount and type of luck involved in a game has a profound impact on the feel of that game. Some games have no luck whatsoever, and all the variation comes from what the opponent does (chess), some of them are all about luck with not much else (roulette), and most of them fall somewhere in between, creating a wide spectrum of possible experiences. We don’t talk much about the role of luck in video games, probably because it’s hidden away under the black box of the computer simulation, but just like with board games, it can have have a large impact in the type of experience the video game provides. Thinking about luck in these terms was crucial for the game I’m working on (still unannounced!). We made some crucial decisions thinking about how luck was part of the game and kind what kind of experience it created for the player. I’m hoping this post helps people with similar design challenges. This post should apply to any kind of game in general (board or video games). Next time, I’ll be focusing especially on luck in video games using this as a launching point for a deeper look. Also, I’m limiting the definition of luck to random effects built into the game system itself, and not due just to player interaction. In games with no luck, players rely completely on their skill to win. In that way, they’re closer to sports. Games become an intense, straight competition, pitting players’ brains against each other. Right there it shows how luck (or in this case, the absence of luck) creates a very specific feel to a game. Good examples of games without any luck are classics such as Chess or Go. There are also plenty of modern board games with no luck, like Puerto Rico, Caylus (they both have a minimal amount of luck in the initial tile order), or Hive. It’s interesting that a lot of abstract games tend to have no luck, and the more thematic a game gets, the more they seem to rely on luck. Points 2, 3, and 4 all encourage more people to play the game and feel they’re competitive at it, even if they didn’t win (and even if they’re not really competitive). One of the best examples of this is poker: Everybody feels they can do great at poker, if only they get good cards. In reality, this is not true in the long term, but poker introduces plenty of luck that it really is true in the short term. A consequence of all those points is that having some amount of luck allows players of different skills to participate in the same game and enjoy it equally. For games that rely on having multiple people looking to play it, it can be a big factor. For games that choose to add some luck element, there’s a whole range of amounts and types of lucks they can use for different effects. Unfortunately, it’s also possible to mix the wrong type of luck with a given game feature and create a frustrating experience instead of an enjoyable one. Post-action luck. This is luck introduced after the player has made a decision and executed an action. It can be in the form of flipping a coin to see if you unlock a chest, or rolling a dice to see if your armies invade a territory. Pre-action luck. Pre-action luck consists of the random events that happen before the player performs an action. The player is able to take them into account and make a decision based on them. Hidden information. Hidden information is the third kind of luck. I was a bit hesitant to include it as its own category first, but it seemed different enough from the other two to warrant being listed on its own. Hidden information refers to things that are known only to some players and will affect other players or the game scoring. OK, I’m going to say it: I’m not a fan of post-action luck. The player has already made its action and the outcome is random (even if it’s based on a probability curve the player is aware of, like rolling 3 six-sided dice). Since it doesn’t add to the choices the player has, it’s mostly uninteresting. This is the kind of luck that can add a bit of spice to an otherwise boring game, it doesn’t do much to make the game more interesting. When used incorrectly, this kind of luck is extremely frustrating. The player can feel they chose the “best” action, but they rolled double 1s and their move backfired on them. Sure, there was some tension knowing that could happen, but was it really fun? Maybe the first time or two, but probably not long term. While I typically really don’t like this kind of luck in my games, there are some situations in which even I will add it can add some interest to the game. The first case is when the player can choose to perform one action or another, being aware of the different probability curves for both actions. For example, you can roll a single die and deal that damage to an enemy, or you can roll two dice, but if you roll two 1s, your character gets hit instead. In a situation like that, even though it’s still post-action luck, the player was presented with a meaningful decision ahead of time and had to weight the risks and rewards of both options. The second case where post-action luck can work is when the action is repeated many times over the course of a game. That way, the outcome of each individual action in themselves is not game-breaking, and all the actions will eventually add up to the average over the course of the game. Luck in this case introduces a bit of noise and slight excitement without affecting things much. This is a good situation to combine with the ability for players to slowly change their probability curves over the course of the game. That way, they can increase their chances of success for an action as the game progresses, presenting the player with a way to feel more powerful. This is often used in RPGs and video games. Having some kind of post-action luck that affects the outcome of an action can also give players hope that they can do something, even if those chances are small. Otherwise, without any luck involved, they would see the situation is hopeless and lose interest in the game. At the same time, having that luck element makes predicting every possible outcome nearly impossible, so it encourages players to make a decision without spending a long time figuring out an ideal outcome. Finally, another situation where post-action luck isn’t always a bad thing is in very short games. I love King of Tokyo even though it’s a complete dice fest with lots of post-action luck. Even if you get some really bad dice rolls, a game maybe only lasts 10-15 minutes, so it didn’t feel like a complete waste of time. On the other hand, losing a 4-hour game to a dice roll can be extremely infuriating. The dark side of post-action luck is the human addition to random rewards, which is the reason why gambling or slot machines are so popular. Games can exploit that human quirk to their advantage and hook players in a game that would otherwise not be very interesting or fun. A very meta post-action luck is buying “booster packs” of collectable card games (like Magic The Gathering). Purchasing the cards is the action, and the luck happens when you open it and see which random cards were in the pack. As most ex-Magic The Gathering players can attest, this can be extremely addictive. This type of luck can add just as much randomness as post-action luck, but creates a very different feel for the game. Since the random event happens before the player action, even if you didn’t get the ideal outcome you were hoping for, you can choose to do the best action given your situation. To illustrate the difference, consider power-ups in a first-person shooter. You open the door to one room and there’s a mysterious gift package power-up. You have no idea what it is, you pick it up and… it turns out it was health. Maybe that’s great because you were low in health. Or maybe you were maxed out and it was useless. That’s post-action luck. Alternatively, imagine you open that door and you see 3 power-ups side by side. You see what they’re going to give you (health, ammo, or a new weapon). As soon as you take one, the others go away. Maybe neither one of them is exactly the ideal, but you can make a decision and pick the best one for your situation. That’s pre-action luck. In board games, Stefan Feld is the master of pre-action luck. A lot of his games involve some kind of luck mechanism that limits your actions. For example, in The Castles of Burgundy or Bora Bora, you roll dice, and the numbers on those dice determine which actions you can take. Without going that far, just about any games that involves drawing cards from a deck and having a “hand” of cards uses pre-action luck. The cards you’re dealt are the pre-action luck, and then you have to do the best you can with those cards. An extreme type of pre-action luck is initial game layout. That happens only a single time during the game, and before players make any actions, so it has the potential to affect the full course of the game. Even players who are adamantly opposed to luck in games, are often willing to accept game setup randomness because it can be fully taken into account during the game without any surprises. Pre-action luck isn’t as common in games as post-action luck, but it could be used just about anywhere that post-action luck is used. Consider the classic situation of a character attack some monsters and rolling a set of dice that determine whether he hits and how much damage it does. We could change that into pre-action luck by having players roll the dice (either all at once or separately), and having the dice restrict the options of what they can do. For example, low rolls on one dice could indicate that they can only do an attack close to the ground, while high rolls means they can attack flying enemies. Then the player can choose which of those actions to take, or maybe he can instead take a defensive stance or run away. The main downside of pre-action luck is that it can extend every player action. The more it’s used, and the more possible choices it presents to the player, the longer the game might take, so it’s best to save it for times where the decisions really matter. If not, either post-action luck or no luck at all, might be better choices. The most common example in board games is hidden end of game bonuses. For example, in Shipyard players get a set of goals that will score them points at the end of the game. There are two reasons for these goals: By giving each player different goals, it encourages players to focus on different aspects of the game instead of fighting over the same set of “optimal” actions. It also encourages players to pay attention to what other players are doing, and potentially try to anticipate or even block other players from getting too far ahead in their goals. An even more interesting case is the game Troyes (one of my favorites!). Not only does each player get a set of end-of-game goals to get extra points, but all players, not just the player holding them, will be scored based on those goals. That makes paying attention to other players and trying to guess what they’re doing even more important. 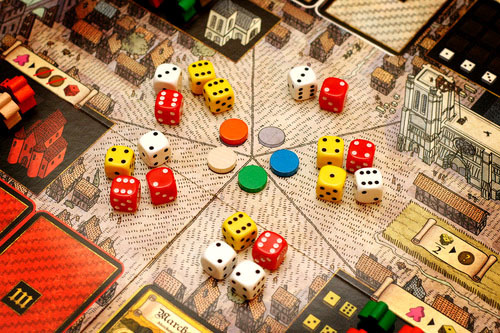 At the extreme end of hidden information there are games like Discworld: Ankh-Morpork, in which each player gets a hidden winning condition. Players go about doing their actions until someone announces at the beginning of their turn that they have won the game, and they reveal their hidden victory condition card. The higher the importance of the hidden information, the more casual and random the game becomes (and so, the shorter the game should be ideally). I started writing this thinking it would be a quick entry about luck in games, but now it’s grown into something pretty large, and I didn’t even get a chance to touch on luck in video games. I’ll look into that next time. Great article… Here is a video from Richard Garfield with his take on “Luck in Games”. Oh wow, that’s great. I was no aware of that video. Watching it right now. Thanks! Really great stuff love the way you wrote. thanks for sharing admin its really very valuable. will visit you again for more stuff.